Certain tourists are highly likely to turn a stay in Florence into a huge shopping spree, which is why they might exclusively see in Ponte Vecchio (the Old Bridge) an excellent opportunity of indulging in the purchase of jewelry, given the Old Bridge is the main thoroughfare of this kind of trade. And, indeed, Ponte Vecchio has been the hub of jewelry trade since the late 16th century when subsequently to the construction of the famed Vasari Corridor, the Medici family prohibited butchers to carry out their activity (the Old Bridge had been the main thoroughfare of meat and meat products trade in Florence since the 13th century) by reason of stench and discrepancy with the newly built Vasari Corridor. Thus, it seemed – at least to the Medici – goldsmiths and silversmiths were the only ones able to develop their activity in harmony with the newly found artistic dash of the bridge. Besides such considerations, it must be stated Ponte Vecchio, just as the name suggests, is the oldest bridge of Florence, dating back to 1345 when Taddeo Gaddi was commissioned to design it as an alternative of replacing a former structure of Roman origins which seemed not to comply anymore with the purposes of the Florentines and which was brought down anyway by a major flood. As an irony of history, Ponte Vecchio is the only bridge over the Arno River to survive untouched the rough circumstances of World War Two, allegedly by an express order of Hitler himself who, apparently, considered a landmark of such reputation deserved to be protected against bombing above all warfare strategies and motivations. 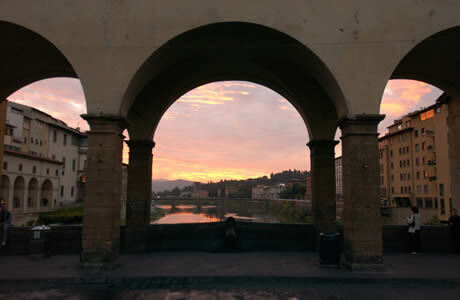 However, the irony consists of the fact that whereas the bridge escaped the war, it is the one bridge in Florence which underwent the most numerous restoration works by reason of wear or floods, the most recent major flood being registered in 1966. 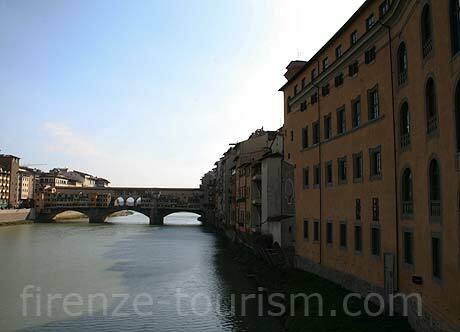 At present, Ponte Vecchio services the tourist platform of Florence by linking some of the most noteworthy places of tremendous cultural, artistic and historic heritage in the capital of Tuscany scattered both on the northern and on the southern banks of the Arno River.